The U.S. Consumer Product Safety Commission has announced a recall of Little People® Builders’ Load ‘n Go Wagon after seven reports of injuries. The back of the wagon’s plastic handle on the Fisher-Price product has molded-in reinforcement which poses a laceration hazard if a child falls on it. About 208,000 wagons have been sold in the United States and 2,800 in Canada, for about $25 each. 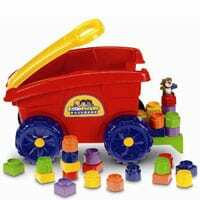 The recalled Little People® Builders’ Load ‘n Go Wagon model number is P8977. Consumers should immediately take the recalled wagons away from children and contact Fisher-Price for instructions on how to obtain a free repair kit on (800) 432-5437 or visit www.service.mattel.com.